i’ve been kind of drowning in fascinating new releases lately, so i’m going to try and give something of a whistle-stop tour through some of the best. Beginning with a couple from the always wonderful Empreintes DIGITALes label. Canadian composer Gilles Gobeil is represented by Les lointains, featuring six substantial pieces created between 2008 and 2013. Gobeil’s particular take on acousmatics is extremely heavily inflected with sharp attacks redolent of industrial machinery. Big impacts litter his music, acting both as material element and structural marker; as such they become antagonistic pivot points about which each piece spasmodically turns and contorts. 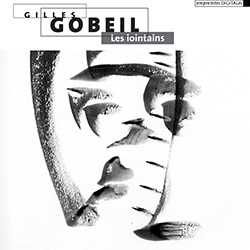 One ends up feeling rather small listening to these pieces, but not just due to their blunt force trauma; Gobeil also punctuates his music with periods of repose that are more void-like and ambient (albeit edgy), broad but delicate vistas that seemingly stretch into infinity, gradually becoming filled with raw material for the next episode of onslaught. The scale, the force, the immensity, the drama—it all adds up to a sequence of experiences that go beyond simply being immersive; one feels enveloped by these six pieces, surrounded on all sides by danger and beauty of utmost intensity. 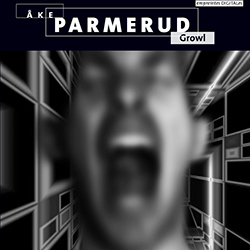 Swedish composer Åke Parmerud, celebrated with a disc of five works nicely titled Growl, takes an approach demonstrably informed by beats and loops. Sometimes he works with familiar materials, as in the clunking ratchets and hydraulic hisses that make up the palette of early work La vie mécanique (composed in 2004). But he turns to unexpected sources too; Grooves is a study in vinyl noise and crackle, rather lovingly woven into a dense tapestry of skittering pulses and clouds of interference (as such, it would make a nice companion piece to Philippe Petit’s Needles in Pain). Growl! opts for the unchecked ferocity of death metal, specifically its gnarled, inchoate vocalisational idiom, which Parmerud uses as the grain for a complex essay that becomes increasingly abstract, walking an unstable and somewhat whimsical line between pulse-rooted clarity and textural mayhem. The highlight is Electric Birds; electronic music has perhaps too often reached to birdsong as a source, but the breeds of exotica captured here (left largely untreated in the first half of the piece) are astounding, and Parmerud’s subsequent response to them is an absolute thrill, a seething, pulsing, fantastical blend of nature and artifice. 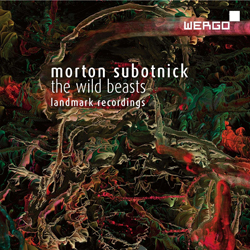 Wergo have recently reissued Morton Subotnick‘s The Wild Beasts and After the Butterfly (originally released by Nonesuch in the early 1980s), in a pristine new edition that betrays no signs at all of age or analog lineage. Both pieces pit small acoustic forces against Subotnick’s ‘ghost’ electronics, in which a tape containing a magnetic representation of a series of “gesture sketches” is used as the basis for electronic transformation of the instrumental sounds. It’s a decidedly uncanny effect; throughout After the Butterfly the central trumpet sounds like it’s madly fluctuating, shivering and vibrating itself to the point of self-destruction, the two surrounding groups in turn barely keeping things all together. 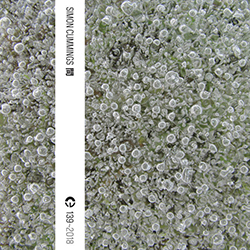 Put more simply, Subotnick establishes a soundworld on the cusp of chaos, induced by the electronics but in turn infiltrating the musical material itself, resulting in a really dazzling display of defocused pitch. The Wild Beasts takes place within a more intimate environment, almost painfully so; its central episode is marvellous, tremulous music struggling to speak as though emerging from a thick fluid. Later it attains a more declamatory posture but the ‘ghost’ electronics persist in making all surfaces oblique and/or undulating. The culmination, descending into a Twin Peaks red room-like environment, pushes its inherent uncanny sensibility to a highly effective extreme, its shimmering veneer unutterably strange. 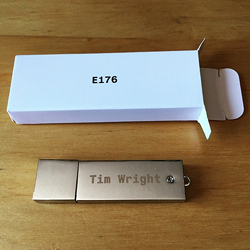 British composer and video artist Tim Wright has a new work available on Entr’acte. Distributed via a USB stick, Algorithms for Electronics, Fake Woodwind and Strings (Third Collection) is a five-movement audiovisual work comprising geometric shapes—predominately lines and circles—that periodically materialise, shift and vanish, simultaneously with slow-moving layers of the kind of timbres intimated in the title (a clip can be viewed here). The relationship between sight and sound is ostensibly clear but a persistent line of ambiguity keeps one guessing as to the true nature of their interactions (both of which are formed from the same source of random data). Wright’s algorithms result in swathes of warm ambience as well as rapid-fire faux-chamber music-like episodes of imitation and counterpoint, often underpinned by juddering slabs of bass. The fourth movement is especially intense in this respect, focusing on strings and revelling in some lovely collections of frequency-clashing beats that become locked in place. Engrossing stuff. 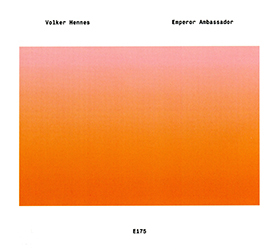 It’s quite rare to be truly surprised by new music, but that was entirely the case with Volker Hennes‘ Emperor Ambassador. The principal is relatively simple, an exciter traversing the surface of a variety of drumheads, repeated numerous times and the subsequent recordings then superimposed on each other. This doesn’t in any way prepare you for the, frankly, incredible results, sounding akin to a huge array of brass instruments improvising at length through an extended sequence of vibrations and pulsations. A sense of coherence is strong, these entirely imaginary ‘instruments’ guided by Hennes into vast slabs of constantly-changing colouration and texture, sometimes bearing all the hallmarks of a direct assault, elsewhere dissolving into spacious dronal episodes of near-stasis, and even a strange kind of gruff dialogue between alien strings and woodwind. Throughout, timbral qualities are nicely ambiguous, at the cusp of sounding acoustic or electronic, reinforced by the untempered nature of its pitch relationships, and there’s a fitting sense of tension permeating everything, suggesting that at any moment the entire music could tilt on its axis into something utterly different. Genuinely some of the most exciting and beautiful music i’ve ever heard. Altogether more WTF is the latest release from John Wall and Alex Rodgers; their last two collaborations have intermingled Rodgers’ leftfield drawling voice amidst microscopically-forged electronic tracery. The texts (by no means the arbitrary stream of consciousness they sometimes appear to be) have always felt more-or-less paramount, but that doesn’t equate to clarity, and in the first of the pieces, ‘Rafia Longer’, the voice is positioned low in the mix, just about projecting itself above Wall’s shuffling rhythmic surface (very different from almost everything Wall has done in recent times), with a recurring refrain about a “halo of candyfloss”. 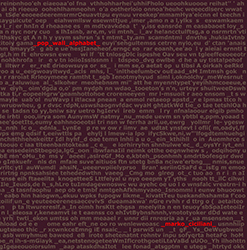 The latter piece comprises four fragments of utterance, articulated by synthetic voices using text-to-speech algorithms. The content is simultaneously prosaic and outrageous, clearer than ever yet completely ambiguous. Wall treats them with kid gloves, delicately dusting them with thin shards and slivers of electronics, in the process shining a spotlight on the truly bizarre and downright hilarious train of discontinuous thought emanating from Rodgers. Available on 7-inch vinyl from Entr’acte, it’s the kind of release for which the phrase “weird and wonderful” could have been invented. Someone with whom i was hitherto unfamiliar, Finnish composer Veli-Matti Puumala‘s Anna Liisa is one of the most harrowing and hard-hitting operatic works i’ve encountered in as long as i can remember. The story (based on the play by Minna Canth) centres on the eponymous character whose life is abruptly plunged into disarray when a horrendous act of youthful impetuosity—infanticide following a fling with the local farmhand—is suddenly made centre-stage in her life again; said farmhand threatens Anna Liisa with her crime being made public unless she leave her fiancé and marry him. The opera similarly passes from the lightest of playful cheerfulness through some initial portents of doom, which don’t always sound apocalyptic: the farmhand makes his opening gambit via his mother, Puumala surrounding her words with a kind of unctuous cloying reverie that makes Anna Liisa’s disgust easy to understand musically as well as dramatically. The music literally drains away at the first realisation of her situation, thence becoming aggressive and ominous, increasingly so as more and more villagers become drawn in, unaware of the facts beneath the surface squabbling and anguish. Anna Liisa’s emotional writhing is, in the best sense, unpleasantly palpable, heightened through heartfelt scenes of intimate conversation and solitary soul-searching. Puumala’s musical language is lyrical and harmonically fluid—melody is of uppermost importance, use of extended techniques is essentially absent (and all the better for it)—turning this difficult and extremely painful story into an extended song of utter despair matched by indefatigable determination. For those who don’t like spoilers, i won’t say how events transpire, but Anna Liisa’s boldness and courage, unequivocally on her own terms, make for a deeply inspiring story. Puumala’s music seems to have been cut from precisely the same cloth as that used by Minna Canth, both guiding and being guided by its tortuous contours, climaxing in an amazing octet radiating pain, its fin-de-siècle tone conveying the truth that, whatever happens next, nothing will ever be the same again. The performances in this world première recording (out on Ondine) are outstanding, the central cast given sensitively-judged support from the Tapiola Sinfonietta and Helsinki Chamber Choir, conducted by Jan Söderblom. And i mustn’t fail to mention Pop Wall Alphabet by Marko Ciciliani, a work that i initially reviewed following its live presentation at the Noise In And As Music conference a couple of years ago. The work comprises 26 pieces, each of which takes a well-known album—by groups and artists such as Abba, Eminem, Kraftwerk, Pink Floyd and U2—and subjects it to extensive treatment involving superimposition of all of the album’s tracks in addition to various ‘spectral freezes’, created through a process that randomises the sound data of each track (a better description can be read in my original review). 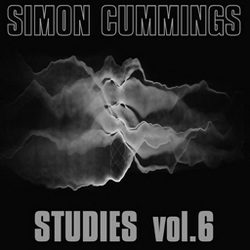 The results are astounding, a cross between a scientific analysis and a new kind of sound art, in which a fascinating noise-based ‘distillation’ of each album emerges, clarifying aspects of timbre, gesture, dynamic range and so on while at the same time playing with aspects of memory and the way the brain imagines it is hearing things that are not actually present. It’ll knock you sideways. In addition to sound, Pop Wall Alphabet also comprises a sequence of visual images and texts that undergo similar processes on the album artwork and song lyrics. The complete work takes the form of a sumptuous hardback book, containing the images and texts plus a pair of essays by Ciciliani and (ahem) myself, with an accompanying DVD containing the sound files. To enquire about getting hold of a copy, you’ll need to contact Ciciliani directly. A mind-boggling treat for the ears, eyes and mind (which will each struggle to comprehend what’s going on in very different ways), i cannot recommend it highly enough.